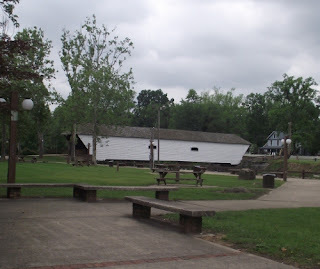 We made an afternoon stop at the Doe River Covered Bridge in Elizabethton, TN for lunch. It is on the grounds of a park with picnic tables. The weather was cooperative which helped make it an interesting place to stop. 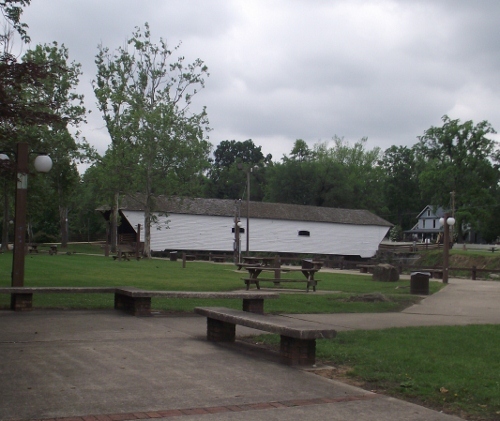 The Doe River Covered Bridge is one of the oldest covered bridges in the south. The short bridge is pedestrian friendly. To drive the point home there are upright metal bars in front of either end. The 34' bridge was built in 1882. It is now surrounded by a park near the center of Elizabethton, Tn. There are a number of benches in the park where you can sit and enjoy the scenery. I got a kick out of one little boy. His mom and grandmom brought a small bag of bread that he was eagerly feeding the ducks and geese with. This was great fun for him until the ducks came too close. Then it was time to head for the nearest grandma or mom -- followed by the ducks. Other families were having having picnics. We also saw a photographer and engaged couple. They were using the Dov River Covered Bridge for a location shoot. They were holding hands and seemed to be having a great time. I wish them many years of happiness. After leaving the park we headed over to a large memorial. It's in the middle of the traffic circle in historic downtown Elizabethton, TN.